PGC’s air-conditioned flame shop is 900 square feet and equipped with 12 workstations, each fully equipped with Nortel Major/Minor torches, a benchtop annealing kiln, a ventilation hood, and a full complement of glassworking tools. Larger annealing kilns as well as Carlisle CC torches and National hand torches are available upon request. Our flame shop has hosted some of the world’s best flame artists, including Emilio Santini, Matt Eskuche, Jill Reynolds, and Loren Stump among many others. A 1-hour minimum applies to all rates in the Flame Shop. Please remember to always check in and out with a technician that is on duty. Other fees may apply for failing to clean up ($25), failing to check out ($25), cancelling within 24 hours ($50), and/or damaging equipment. 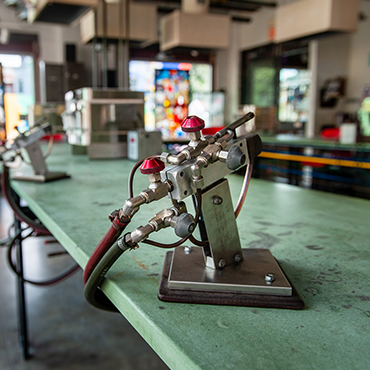 Open studio is available for students who are currently enrolled in a PGC flame shop class. A technician will be on duty to answer questions or help troubleshoot.